The Lochac Order of Grace (LOG) is an award given a maximum of once per reign in the Kingdom of Lochac. The token for the award is a pouch displaying the badge of the order: Gules, a hind courant Or between three mullets of six points argent. 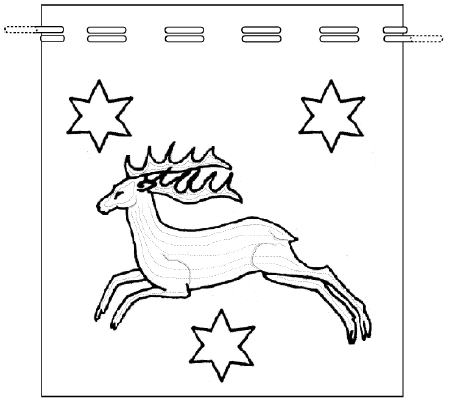 Or, in plain English, a leaping stag with three six-pointed silver stars. For two years I had been adamant that I was going to make a LOG pouch. 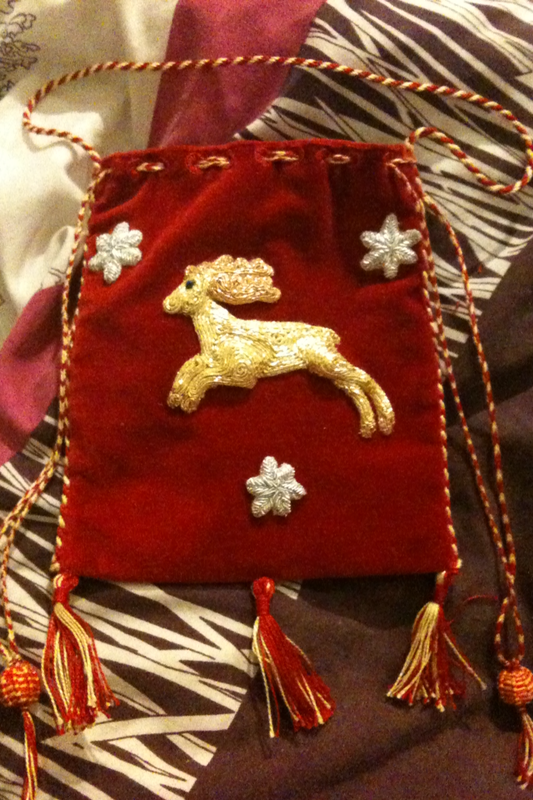 In fact, in 2008 I had begun (and almost finished) a padded goldwork deer for a LOG pouch. When I was about 90% of the way through, I decided the execution was all wrong and put the project aside. By this time I had attended my first ever class on goldwork – a class by Mistress Contarina Cassagrande called ‘Basics of Goldwork’ – and figured I could do better. Putting aside the project was a silly idea because it got added to a long list of unfinished plans and periodically forgotten. For May Crown AS45 (2010), Mistress Rowan Perigrynne held a competition on behalf of the Worshipful Company of Broiderers (WOCOB) for making a LOG pouch. This reminded me of the project I had started previously, and it annoyed me that I hadn’t actually finished a LOG pouch. I was going to attend this event and I couldn’t help but use it as an excuse to finally get this item off my list of things to do. As a result, I challenged Baroness Isobel le Breton (Politarchopolis – a former recipient of this award) to join this competition with me (challenges being a good way to provoke me into dedicated action). Elizabethan sweet bags were ornately embroidered, relatively small pouches used to hold pleasant scents, coins or small gifts (HNR, 2010; TMMA, 2000-2010; Sparrow, accessed August 2013). They were common in 15th and 16th century England and could be embroidered with many different techniques including: tent stitch, double-running stitch, laid and couched, couching and detached buttonhole (HNR, 2010; Perigrynne, 2003). The embroidery was often done using gold and/or silver metallic threads and colourful silk threads on a base fabric of linen canvas, silk or velvet (HNR, 2010; MFA, 2010; Perigrynne, 2003; TMMA, 2000-2010). The competition stipulated that you could make a LOG pouch of your own design, or utilise pre-existing designs created by Mistress Rowan. These designs, covering seven different embroidery styles and periods, are located on the LOG Pouches page of the WOCOB website. My first point of reference was to look through the instructions for the ’15th-16th Century Laid Goldwork’ style LOG pouch. It outlines the techniques of this embroidery style and provides a template for the pouch itself. I used this LOG badge pattern from Rowan’s 2003 notes on the WOCOB website. My second point of reference was to briefly look into extant Elizabethan Sweet Bags for inspiration. I noted that the embroidery motifs on these bags were commonly flowers, plants, insects, birds, and, less frequently, beasts such as stags. The entire visible surface of the bags are often covered in colourful, ornate embroidery. Most examples I have seen are also adorned with equally colourful woven purse strings and cords. Tassels are common, with sweet bags often displaying 3 tassels along the bottom of the pouch and one on each of the two ends of the purse strings. Another common feature are wooden beads that have coloured silks woven onto them. 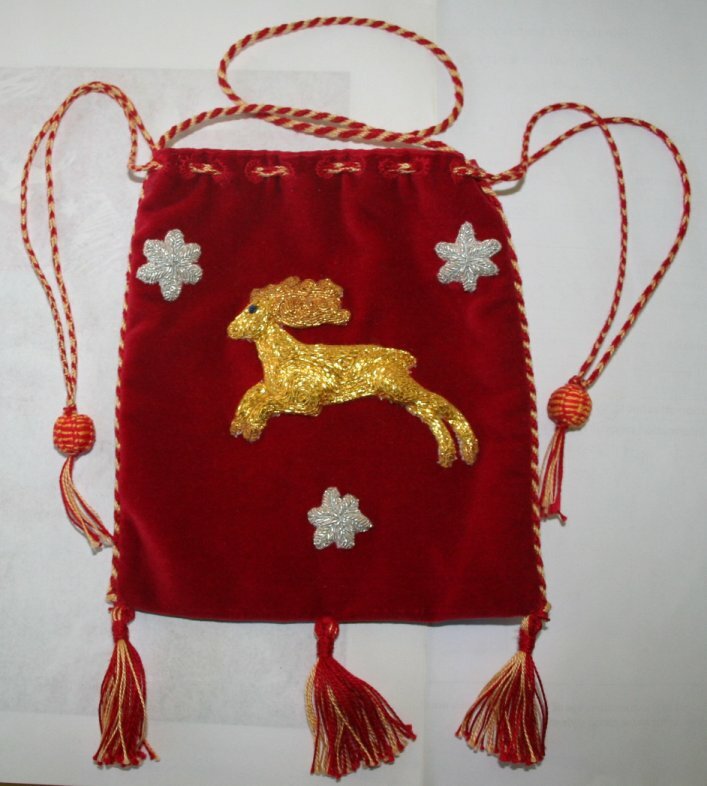 The first step was to embroider the stars and deer onto some linen, to be then appliquéd onto the pouch. 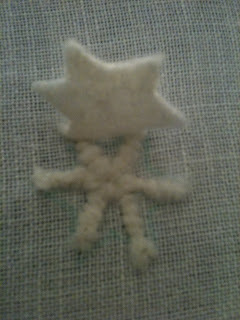 The stars were padded with bamboo wadding and are couched silver twist with silver purl in-fill. I chose a white padding to best blend in with the silver embroidery (I didn’t want colours showing through that were unrelated to the design).To add three dimensional depth to the stars, I first couched down spines of the wadding. I opted to sew an entire star (using stab stitch around the edges) of the wadding over the top of the spines to smooth down the shape, whilst retaining it’s three dimensional attributes. Ceara’s felt star was sewn over felt spines to increase the three dimensionality of the embroidery. 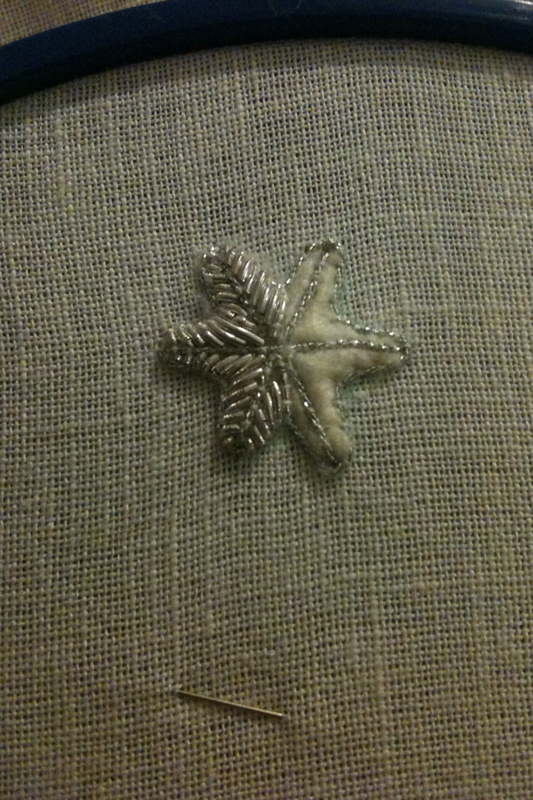 Once the felt is secured, the silver thread was couched around the edge of the star, and through the middle along all of the spines to further emphasise the shape. This design idea was inspired by my observation that stars (also known as mullets in heraldry) were sometimes drawn in such a manner, pressumably to give them depth. I wanted to try and incorporate this into my piece. The stars were then filled in with silver purl. Each arm of each star was made of two parallel rows of purl, with the purl pieces placed at about 45 degree angles to the middle of the star. A half-finished star showing the purl in progress. 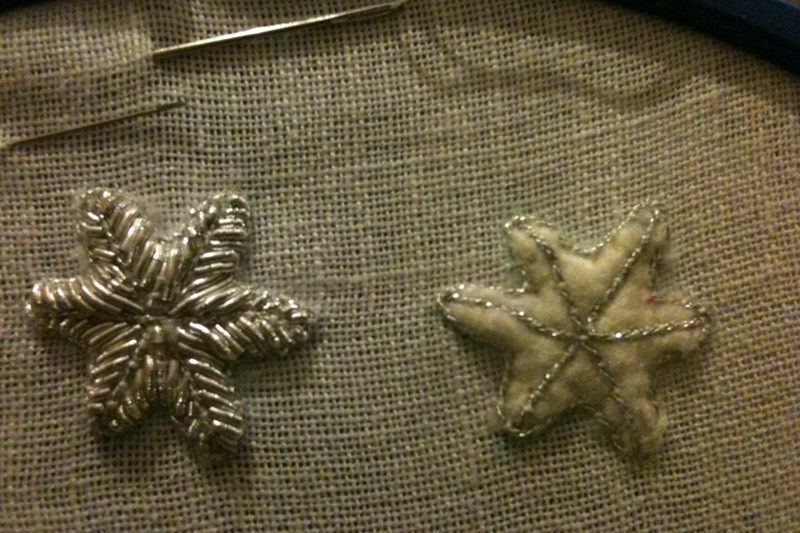 A completed star (left) and an in-progress star (right). 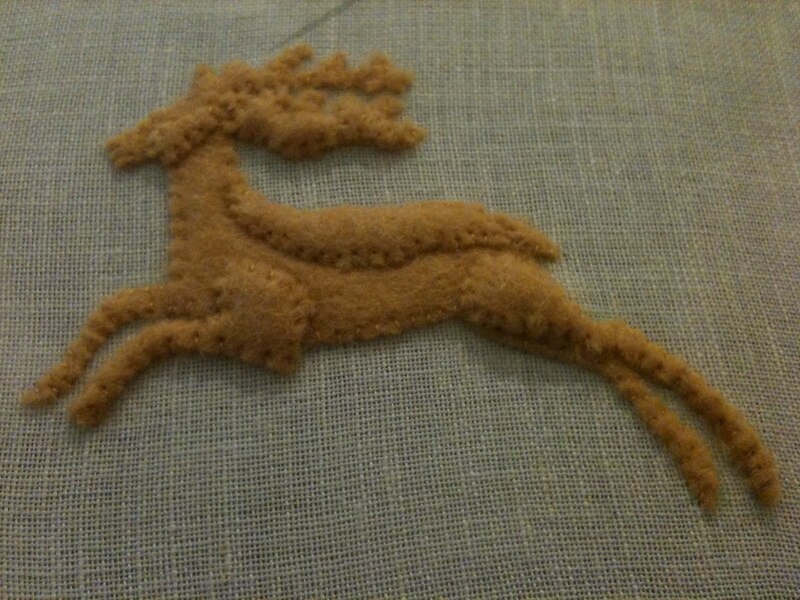 The deer is padded with so-called ‘honeybiscuit’ felt from Berlin Embroidery (an online embroidery store based in Canada). As a side note, I have had nothing but great experiences with this company. The materials I’ve bought (including spangles, metal threads and felt) have always been good quality and received quickly. Their felt is a nice, tightly-packed felt that holds small detail well when cut out. Though, you still have to be careful. The padding is stab-stitched down in many layers, with the parts of the animal in the background of the deer consisting of minimal padding (often a single layer) and the foreground aspects emphasised with up to 3 or 4 layers of padding. In my design, the foremost legs, antler and cheek of the deer are built up to the highest level. The padding in Ceara’s deer is built up of many layers. 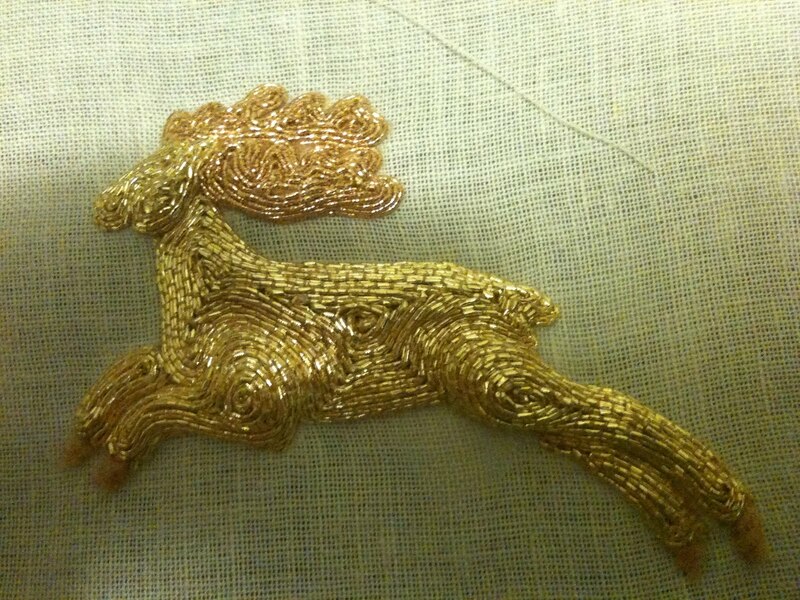 The deer was entirely couched down using a yellow-gold colour of Gutterman silk sewing thread. The antlers and hooves were embroidered with an ‘old gold’ coloured gold twist. The body was couched in a thick, bright-yellow-gold ‘jap’ thread. One way to add detail in couched goldwork is to follow the natural lines of the shape, rather than just starting from the outside of the whole shape and working your way in. In my couching I isolated several different parts of the deer, including each leg and associated muscle, each antler, the body, the cheek and the face. In line with the period examples of couched goldwork I had previously seen, I couched the gold threads down in pairs. When the deer was completed, I sewed a blue, glass bead down for the eye. The bead was one of a collection of beads won in a tournament for me by my consort Jonathon of Loch Swan. Close up of the goldwork deer by Ceara, complete except for the hooves and eye. Once the deer and stars were completed, I cut them out from the linen (leaving about half a centimetre or less of linen around the edge of the shapes). This allowed the linen to be tucked under the embroidered shapes during the appliqué process (thus leaving no edges exposed for fraying). The pouch itself was made of a rectangle of red velvet (given that there are examples of velvet sweet bags, this seemed appropriate) and lined with linen. It’s worth noting, however, that most extant sweet bags seem to be lined in silk. In line with Mistress Rowan’s suggestions in her LOG pouch instructions, I made three tassels for the bottom of the pouch. The tassels are made of cotton because I did not have access to enough silk threads for the purpose, which I would have preferred, and it also allowed them to match the cord and purse strings. The cord that was stitched down along the edges to form a handle for the bag is also made from the same cotton thread as the tassels. Again, this is due to me having no access to sufficiently long silk thread (Madeira silks only come in 5m lengths, which is not long enough for fingerloop braids of any suitable length). The cord is woven in a spiral using an 8-bow fingerloop braiding method. The purse strings were made of the same cotton thread, again, as the cord and tassels. They were woven into a string with a chevron pattern using a 5-bow fingerloop braiding method. The two beads decorating the tassels on the purse strings (again, inspired by extant sweet bag purse strings which also exhibit thread-woven beads) consist of a wooden core woven in silk thread. They are in the style of 16th century, spined, thread-woven buttons. If you are interested in making such beads/buttons, see my ‘A&S Class Notes’ for my class on ‘Thread Woven Buttons’. My LOG pouch was finished and documented for the event. Unfortunately, I’m not able to locate my original documentation for this project. Excitingly, it one first prize! The pouch was given to the Crown for awarding at their discretion. I was so pleased to find out that it was given to Sir Gabriel de Beaumont! Ceara’s finished LOG pouch, photograph by Rowan 2010 (as published on the WOCOB website). Perigrynne, Rowan, 2003. Designs for the Lochac Order of Grace: 15th-16thc Laid Goldwork. TMMA (The Metropolitan Museum of Art), 2000-2010. Purse. Item 1986.300.1. HNR (Historical Needlework Resources), accessed 2010. Sweete Bags. MFA (Museum of Fine Arts, Boston), accessed 2010. Drawstring bag. Item 119689. Sparrow, Amie (accessed 2013). Sweet bags: Who made them & their purpose. VAM (Victoria and Albert Museum), accessed 2010. Purse. Item T.127-1992.